Investment Banking is a form of banking which finances major capital requirements of a business enterprise. These capital requirements are in the form of financial help to launch an Initial public offering (IPO), Private Placement, Bonds and in the Merger and Acquisitions and other services related to investment management, portfolio management, Risk Management, FICC services and equity securities and trading of derivatives. Investment banking companies provide all kinds of investment services and solutions to individuals, corporates and governments. They create capital for their clients and provide best solutions and strategies for Merger and Acquisitions and trading of securities as well as advice on risk management. One of the major activity of modern banks is an investment. Nowadays both commercial and private banks are focusing more on the investment banking sector. Below is the List of Top Investment banks ranked according to the total revenue. JP Morgan Chase: One of the Big Four banks of the United States, JP Morgan Chase is a multinational banking and financial services holding company based in New York City. JP Morgan Chase is present in 60 countries around the world. With total assets of around USD 2.5 trillion, it is the sixth largest bank by total assets in the world. According to the Forbes Global 2000, JP Morgan Chase is the sixth largest public company in the world. Goldman Sachs: Founded in 1869, it is one of the major global investment banking firms which services mainly institutional clients. It has strong client relationships with major corporations, governments. 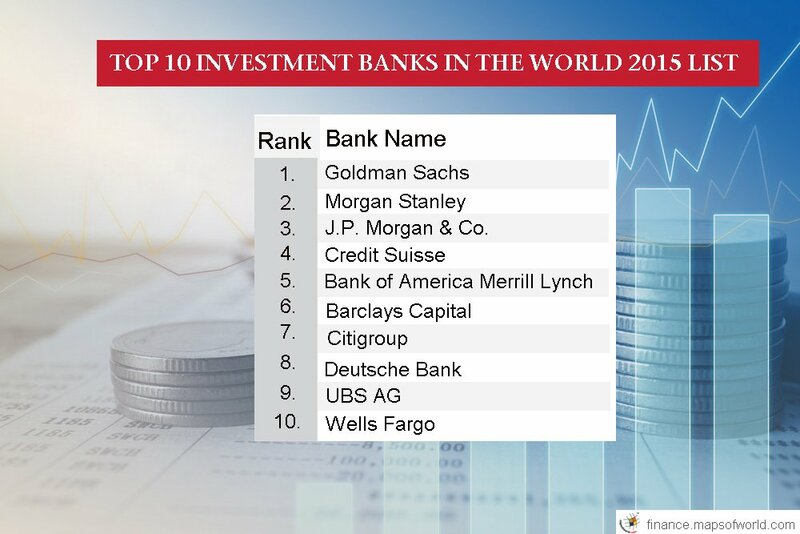 Goldman is one of the Top investment banks with US$ 37.71 billion revenue. Some of the services provided by the bank include asset management, acquisitions advice, mergers and prime brokerage among others. It also offers underwriting services to its customers who include corporations, governments, and individuals. Apart from this, Goldman Sachs also deals in market making and private equity deals. Bank of America Merrill Lynch: It is one of the major financial services company in the United States and is highly regarded for its investment banking services. Some of the major services provided by the bank include mergers and acquisitions, equity and debt capital markets, lending, trading, risk management, research, and liquidity and payments management. Morgan Stanley: The bank was established on September 16, 1935, and is a global financial services provider serving a diversified group of corporations, governments, financial institutions and individual. Headquartered in New York City, the bank has a presence in 42 countries. Morgan Stanley’s workforce comprises more than 55,000 employees. As of 2016, the revenue of Morgan Stanley stood at US$37.95 billion. Citigroup: It is a leading financial services company based in Manhattan, New York, United States. The bank has operations in around 160 countries. With 357,000 employees, the bank has more than 200 million customer accounts worldwide. In the Fortune 500 list in 2016, Citigroup ranked 29th in size. As of 2016, the bank’s revenue stood at US$69.87 billion. Barclays Capital: It is one of the major investment banks in the world. It is European Bank based in the United Kingdom that has global operations in investment banking and other financial services. It has offices in 29 countries and has over 20,000 employees. Credit Suisse: Based in Zurich, Switzerland, Credit Suisse provides major financial services including investment banking, Asset management and Private Banking. Founded in 1856, Credit Suisse today employs around 48,200 people. As per the Scorpio Partnership, Credit Suisse had $888.2 billion of assets under management in the year 2014. This was an increase of 9.5 percent over it’s 2013 figure. As of 2015, the bank’s revenue stood at CHF 23.38 billion. Deutsche Bank: It is a global financial services provider dealing with a wide range of financial products and services including many investment management services. Deutsche was founded in 1870 and is based in Frankfurt, Germany. The bank operates in 70 countries around the world and has a workforce of 100,000 employees. Investment banking forms the core business of Deutsch bank. This business represents 50 percent of profits, 50 percent of equity and 75% of leverage assets. RBC Capital Markets: It is a global investment bank with its headquarters in Toronto, Canada. 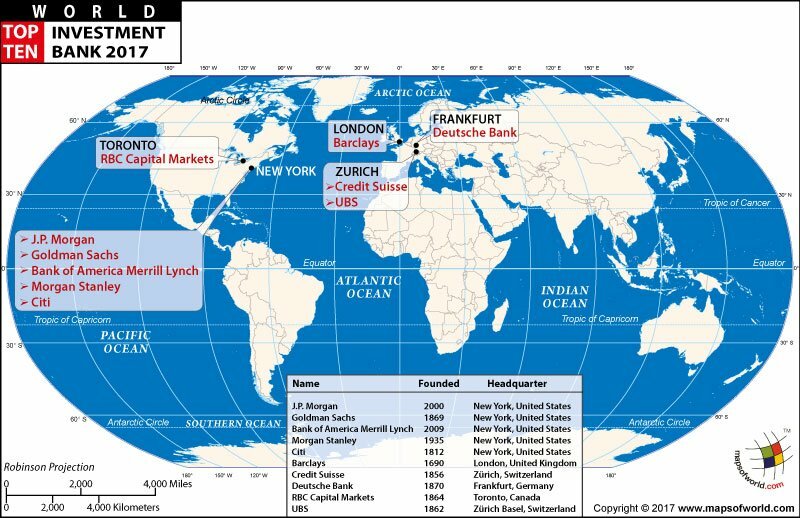 RBC Capital Markets has 70 offices in 15 countries in North America, the United Kingdom, Europe, and the Asia-Pacific. Some of the services the bank provides to its customers are banking, finance and capital markets. UBS: UBS is a Swiss global financial services company. The bank is incorporated in the Canton of Zurich and is co-headquartered in Basel and Zurich. The company provides services in the fields of asset management, wealth management, and investment banking. UBS works for corporate, private and institutional clients around the world. One of Switzerland’s leading banks, UBS is present in around 50 countries and has a workforce of approximately 60,000 people. Investment banks give advice to their clients on a number of issues such as raising money, advising clients on buying and selling companies, economic risk management, buying financial products etc. They also provide financing such as purchasing shares of corporates or helping them in finding other parties to do so. On behalf of the clients and raise capital for the bank they buy and sell shares, commodities, debt products among others.